Beep Club - Blog - Oh no! Region Block! 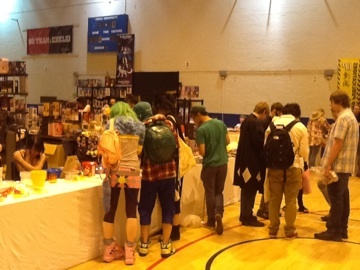 A few weeks back when I attended Amecon 2012, I no doubt bought as much merchandise as my budget of 200 pounds could carry, anime DVD's included. Only I found that after I returned from the con, I discovered I bought a region 1 DVD boxset by mistake ('Eden's Bowy' is the name of the series, for those who desperately wanted to know). Being that I live in the UK (which is within DVD region 2), I had to use up one 'region compatibility change' option on my Macbook to play it (now I'm on three left), which is rather a nuisance. Luckily, I downloaded VLC for my mac so I can watch DVD's regardless of the region from now on. Which (finally) brings me to the point. In this day in age, people are better connected to one another regardless of distance and the time it takes to get in contact with them, we have access to more content and more choice of entertainment, and most of us are starting to tolerate the most obscure of quirks. All thanks to the Internet! So why is it that some forms of entertainment are restricted by region? Besides the paranoid assumption that it reduces piracy? I might have a long, philosophical answer for that, but... Never mind. I guess that's why I'm working on this webcomic for everyone around the globe to read. At least that's not region blocked. 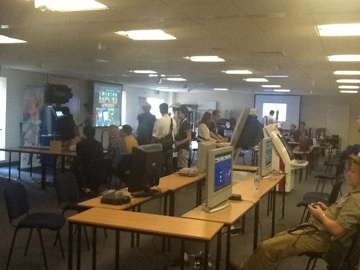 I've just returned from the 2012 amecon last night and here I am, back at my 'typing terminal', writing this blog entry about how great the weekend has been. I'll apologize now for the pictures presented here. I took these using the in-built camera on my iPad 2, which absolutely isn't of the best quality. It's been so long since I got back in touch with my geeky senses after all these years, watching anime screenings (Lucky Star, Tiger and Bunny), playing fighting games such as 'BlazBlue' and 'Persona 4 arena' in the games room (which I felt didn't have as much games on offer as I hoped it would) and virtually blowing over 200 quids worth of anime merchandise in the process of things! Incidentally, (pardon me bragging) I also met the anime artist, Destiny Blue at the artist dealers section for the second time now, since Thought Bubble 2011. And I must say, she's really talented, too. There were a lot of interesting panels that took place at the event, too. Like how to write fan fiction, how to start a webcomic, the history of the magical girl sub-genre, how to 'Itasha' - the art of decorating your car with anime characters, and there was even a cel painting workshop. The materials we were given may have been terrible, but god, did it feel so nostalgic. But the highlight of the convention, I reckon, is the screening of Anime Forever, a documentary of anime fan culture and how proud and ecstatic it can be. I was very moved by how this film showed us how much fandom has grown, it was inspiring to see convention attendees expressing themselves without fear of being judged by other people. There probably isn't a full version on Youtube yet, but you can see a trailer for it here. I'll close now with one final thought of the matter. 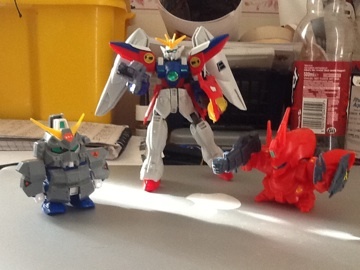 Gundam robot model kits are really good fun! And now it's back to work on my webcomic with renewed vigor. Don't miss the next update on Friday. This will be the webcomic's first official blog entry, hurrah! For now, I've not much to write about but this week from Friday till Sunday, I will be attending this years Amecon, anime convention at Staffordshire in hopes of promoting this here webcomic. But if anything else I'll just be chilling, being that it is the summer holidays after all. I'll be sure to upload a few simple snapshots in the future, in the meantime I'll upload this week's page a day earlier on Thursday, so I don't forget, simply.